Toyota is the Philippines's Best Selling Car Brand for 16 Straight Years. 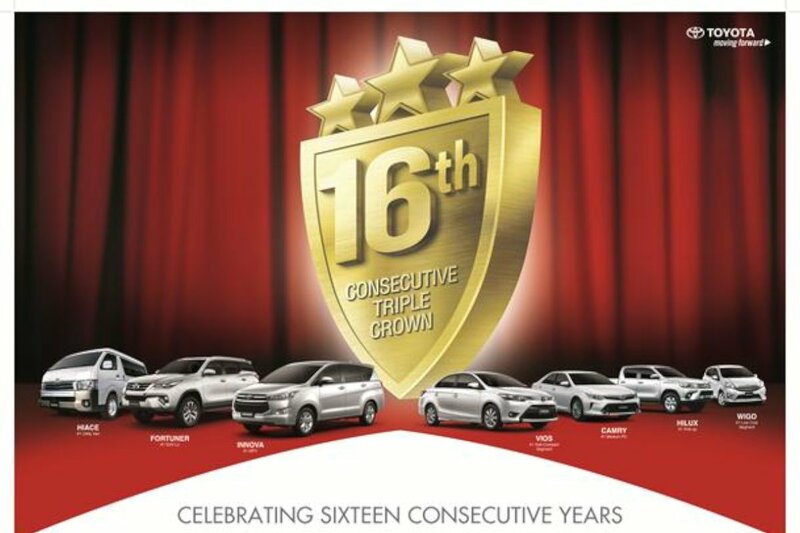 Toyota announces the achievement of its 16th consecutive Triple Crown, maintaining its position as the number one brand in passenger car sales, commercial vehicle sales, and overall sales in the Philippines. Garnering a record-breaking sales of 183,908 units, 16 percent up from 2016, Toyota solidifies its position as the number one automotive brand in the country, with 38.9 percent market share. Its major models: Wigo, Vios, Camry, Innova, Fortuner, Hilux, and Hiace also topped in their respective segments. Likewise, the Fortuner was able to achieve a new milestone of 39,680 units sold and the locally manufactured Vios selling 36,734 units. The Fortuner actually was the best-selling vehicle in the Philippines last year. On its 30th year, Toyota continues to uphold its commitment to provide always better cars, always better ownership experience for its Filipino customers as a way to show appreciation for their unwavering trust and confidence in the products, services, and the Toyota brand. Well deserved, Toyota is a great brand. Reliable and very easy to maintain. Ang ayoko lang is when you drive on the road lahat puro naka Toyota. Especially vios and fortuner lalo na yung nadikitan lng ng TRD sticker feeling nka sports car na. As they say, you can never go wrong with a toyota. Our family has a toyota for different generations. I really like what they did with the new wigo and innova. Congrats!